The consensus? You look beautiful, Caitlyn. Now let's get to work fighting systemic transphobia. Caitlyn Jenner kicked off Pride Month in a big way today, with a glamorous Vanity Fair cover, shot by iconic out photographer Annie Leibovitz, proclaiming "Call Me Caitlyn." The former Olympian and Kardashian stepparent, once known to the world as Bruce, revealed her new name (and preferred pronouns) in an exclusive feature that was by and large well-received. While many celebrities, such as Ellen DeGeneres and Jenner's doppelganger Jessica Lange, celebrated the newly out trans woman's unquestionably gorgeous debut, The Advocate was paying special attention to how trans people responded to the viral hashtag #CallMeCaitlyn. And one predominant theme emerged: Celebrate Jenner, then use that energy to focus on disenfranchised trans women. 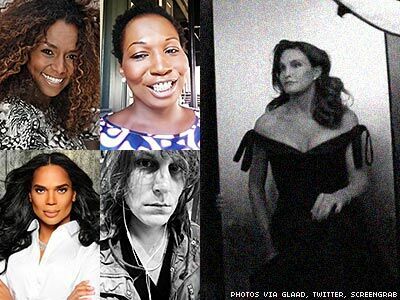 Lourdes Ashley Hunter, the National Director for the Trans Women of Color Collective, applauded Jenner's truth, then refocused the conversation on ways to support trans women in need. SHOUT OUT to #CaitlynJenner Do ya thing girl! SHOUT OUT TO ALL THE GIRLS WHO PAVED THE WAY FOR #CAITLYNJENNER TO LIVE UNAPOLOGETICALLY IN HER TRUTH! All y'all mad about all the #CaitlynJenner coverage, DONATE to @TWOCCNYC at http://t.co/yuZ83a59YR and make yaself fell better! Indeed, many activists focused on the systemic issues facing transgender Americans — and trans women specifically. Sending all my love to my trans sisters who didn't get this sort of beautiful welcoming from the world. You deserve to be celebrated too. Cis conservatives are measuring success in anti-trans laws passed, cis liberals are measuring it in magazine covers. Please switch places. So, a rich white republican lady got the Annie Leibovitz photoshop treatment on the cover of Vanity Fair. That's a thing that happened. in america we celebrate rich white trans women (read: #caitlynjenner) but disregard the lives of black, and brown, trans folks, spec. women. also: people will retweet and celebrate #caitlynjenner and look at poor black and brown trans* girls, who can't/refuse to pass, w/ disgust.